Peter Singer's latest cause is lifting billions out of poverty. If the wealthiest 10 percent of American families set aside at least 5 percent of their after-tax income, US$471 billion would be available each year to house, heal and feed the world's poorest 1.4 billion people. This is vastly greater than the US$189 billion a year needed to meet the Millennium Development goals -- the UN's targets for halving world poverty by 2015. Hence, if people who suffer such dire poverty can be helped at the cost of so little sacrifice, it is morally depraved not to do so. 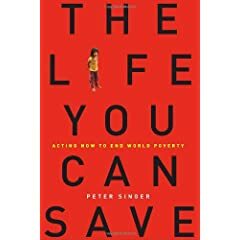 Such is the contention of Peter Singer, the world's most controversial philosopher, in his latest book, The Life You Can Save: Acting Now To End World Poverty. Singer is better known for supporting euthanasia and animal rights than for moonlighting as Mother Teresa. But his fans should not panic -- he uses the same principles to argue for both philanthropy and infanticide. I suspect that very few charitable foundations will be inviting him to join their boards of directors. To his credit, for many years Singer has been a passionate advocate of a frugal lifestyle and philanthropy and a stern critic of the consumer society. He gives away 25 percent of his own income. As far back as 1972, he wrote an influential article, "Famine, Affluence, and Morality", which asked how it could be ethical to ignore the suffering of starving and diseased people. Singer seeks to shame Americans and citizens of other wealthy nations into digging deep. He cites heart-rending statistics to show that more people have died of preventable causes over the past 20 years than in all the wars and all the government repression of the bloody 20th century. It is deeply immoral, he says, to ignore this suffering. "I guess basically one wants to feel that one's life has amounted to more than just consuming products and generating garbage. I think that one likes to look back and say that one's done the best one can to make this a better place for others. You can look at it from this point of view: what greater motivation can there be than doing whatever one possibly can to reduce pain and suffering?" Although The life you can save is rather skimpy on philosophy, it is an important book. It softens Singer's image as a brutal foe of human dignity and waves a magic wand over utilitarianism, transforming it into a philosophy of compassion, altruism and self-sacrifice. He even showcases utilitarian saints, people who have sacrificed large chunks of their income to help the poor. Is it a coincidence that the motto of the Bill & Melinda Gates Foundation, "All lives have equal value" is a fundamental axiom of Singer's philosphy? One of Singer's heroes is Zell Kravinsky, an American who has two PhDs, has lectured on the poet Milton and has made a large fortune in Philadelphia real estate. Instead of wallowing in the sty of filthy lucre, he has given most of it away. He has but one suit, which he bought for $20 at a thrift shop. He even donated one of his kidneys to a stranger, ignoring his wife's objection that one of his children might need it some day. But, Kravinksky responded, "The sacrosanct commitment to the family is the rationalisation for all manner of greed and selfishness." I suspect that Singer's sotto voce message is that Christianity (and other world religions) have failed to motivate people to live the Golden Rule, notwithstanding all their guff about human dignity. Utilitarianism is no less noble, and there's no guff. However, when examined more closely, Singer's reasoning raises more questions than it answers. First of all, it is not at all clear why a utilitarian should care about anyone else's welfare. With Singer it is axiomatic that we should relieve the suffering of other creatures. But why? What unites us? Why should I rescue a child drowning in six inches of water in a wading pool? And why should I be interested in the suffering of distant Africans? In a desperate attempt to show that we have a responsibility for helping Africans, Singer argues that each one of us has generated a proportion of greenhouse gases which bring drought and starvation. But even if this is true, it is not very motivating. Not for me, anyway. Second, there is something chilling, even inhuman, about Singer's insistence that personal relationships are irrelevant. Another of his saints is a Harvard-educated doctor who works in Haiti, Paul Farmer. Farmer wrestles with the awful feeling that he is continually tempted to love his own child more than his patients. He calls it a "failure of empathy". If utilitarianism cannot account for a father's love for his own child, it's not much of a philosophy. Third, whom are we obliged to help? After a while, it dawned on me that Singer is not interested in relieving the suffering of persons as individuals, but as members of crowds, as statistics. What motivates him is not charity, but irritation that resources are being deployed inefficiently. Besides, given what we know about Singer's interest in animal liberation, don't "all lives" include great apes, dogs, dolphins and pigs? They probably do, although it is hardly tactful to mention non-anthropoi in a tract about philanthropy. In Singer's system, even "the joy of giving" is a dreary business. It may indeed give you joy, but his joy is just an evolved neurological response which lights up the brain's reward centres in MRI scans. As for the hungry Africans, once their immediate suffering has been relieved, I suspect that Singer will lose all interest. He has nothing more to offer. The things that bring meaning to most people's lives -- happiness, art, family ties -- are almost meaningless for him. There is a curious inconsistency which runs through Singer's life and work. It is well known that he broke his own rules by caring generously for his mother after she was stricken with Alzheimer's disease. In some strange way, he seems to be constructing a philosophical foundation for Christian virtues like charity and self-sacrifice without admitting that human beings possess an inherent and inalienable dignity. But his clunky utilitarian calculus just doesn't work. I wonder just how successful he will be at inspiring people to abandon their iPods and yachts to save the poor. A few weeks ago I was lucky enough to attend a packed lecture at Melbourne University by Singer to promote The Life You Can Save. His audience was goggle-eyed and the questions were more marshmallows than softballs. So I asked him one. What if you had to choose between feeding a dozen stranded dolphins and feeding a dozen brain-damaged infants with a low life expectancy? He looked quite irritated and didn't give a clear answer. So much for the philanthropy of our ascetical utilitarian guru.